I was certainly surprised today when I learned that Cisco is shutting down its Flip camcorder division. The Flip camcorder has only been with us about four years, and Cisco has owned the company for only two, all the while the Flip has pretty well stood on top as the best selling camcorder in the US. Without a doubt the Flip revolutionized the camcorder industry, providing a very simple to use camera that just plain worked. The success of the Flip was helped along by the mainstreaming of YouTube and computers finally having enough processor horsepower to make light work of editing its compressed MP4 video files. But the Cisco acquisition of Flip always struck me as a strange marriage, given that Cisco otherwise is a network hardware company whose only other consumer products are Linksys home networking products. While the spread of home broadband helped fuel Flip sales because it finally became practical for the average person to upload and share video, that’s still a weak connection between the two product categories. Many commentators are declaring that the iPhone and smartphones in general killed the Flip. It’s a seductive argument, but a very shallow one. While Flip sales were down around 16% this past holiday season I don’t think it was sales, per se that motivated Cisco to shut it down. Rather, the Flip is in many ways a victim of its own success. 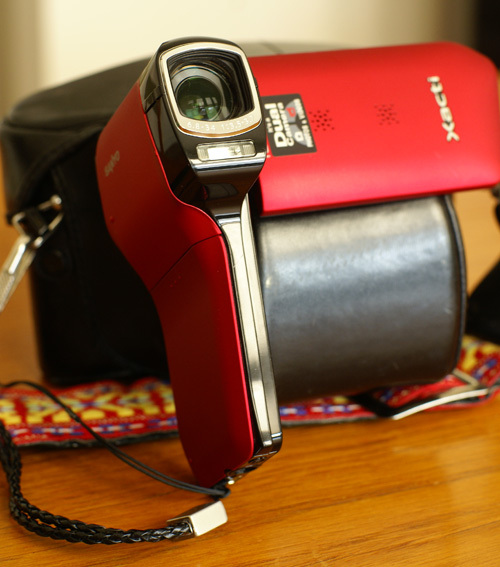 Prior to the introduction of the Flip there had been a few attempts by electronics makers like Panasonic and Samsung to introduce small flash-memory camcorders which failed to take hold in the market. Sanyo was actually an early success story with its Xacti line of standard def and HD camcorder, though never a runaway success like Flip. As most observers now know, Flip beat all the big guys by making a camcorder that was super simple to use — no extraneous buttons and controls, just one big record button, like an old-school tape recorder. While Flip caught its competitors by surprise, that first-mover advantage didn’t last very long. Within a year Flip had created its own market segment, challenging Sony and Kodak, in particular, to jump into the palm-sized camcorder market with both feet. Sanyo answered the challenge by reducing the price on its Xacti line while retaining higher-end features like an optical zoom lens and flip-out screen. Even though Flip remained on top, these other manufacturers soon were nipping at its heels. Flip’s sales may have decline this past holiday season, but at the same time sales of small compact camcorders grew as models proliferated. Sure many of these competing models offer none of the Flip’s precise alchemy of decent picture quality and bone-simple operation, but in a crowded market there’s always rooms for bargain-basement bottom-feeders. Now, I don’t doubt that the increasingly-credible video recording features of smartphones aren’t having an impact on the camcorder market as a whole. It’s true that much of the time folks don’t want to carry anymore devices than they have to. And so, if their smart phones will record good-enough video, that’s a disincentive for carrying along a separate camcorder. However, by that same logic we should expect the market for digital cameras, especially dSLRs to be declining, which it isn’t. I can think of dozens of reasons why someone would want to use a Flip or other small camcorder instead of a smart phone to record video. First off, there are places where you don’t want to bring your smartphone and risk it being damaged or lost. And, although iOS and Android are relatively easy to use, they still don’t hold a candle to the Flip’s one-button simplicity. Camcorders like the Flip have also been very popular in schools, where it’s far less risky to hand a ten year-old a $100 camcorder than have her mess around with a smartphone or more expensive device. Picture and sound quality are still important aspects, even if smartphones have made significant gains in the last year, many offering 720p HD video. For instance, I have an HTC EVO Android smartphone which features an 8 megapixel camera that shoots 720p HD video. The video is pretty good, but still doesn’t measure up to my Sanyo Xacti VPC-CG10, which also has a 5x optical zoom and costs less than the smartphone. I also think the Flip and Kodak HD camcorders also offer better video quality than any smartphone I’ve seen, even if the gap is closing fast. Nevertheless, I can understand Cisco’s position, especially given that it’s really not a consumer electronics company. Keeping up with the market will require a faster product cycle along with a shaving of margins of the sort that Sony and Toshiba are more used to. Simplicity of operation and brand recognition are worth something, but they meant more when there were fewer than a handful of competitors. I do think that the peak has passed, as it always does when a new product segment is created. Cisco may not be acting rashly in getting out of the inexpensive camcorder business. That does not mean the segment is going away. The challenge for the manufacturers still making Flip-style camcorders will be to keep the video quality higher than smartphones, without also over complicating their product. The other building competition comes from still digital cameras that offer video close in quality with a simplicity in use that comes close to the Flip-style cams. I still think that people who are focused on shooting video are going to want camcorders rather than a multifunction device. A video-shooting smartphone is great when you happen upon a video-worthy moment you weren’t planning on. But when you’re intending to shoot video it really helps not to be distracted by twelve other functions, or have your shooting interrupted by a text message or phone call. The Flip certainly introduced many millions more people to the joy of shooting, editing and sharing digital video, accelerating a trend that started a decade earlier with the first miniDV camcorders. It’s strange to see Flip exit the market so quickly. But just like the loss of Atari didn’t mean the end of video games, there will be Flip-style camcorders long after the death of Flip itself.